Tyre labelling for passenger cars and light trucks took effect from November 2012, for tyres on sale in the EU under European Regulation (EC/No. 1222/2009) which were manufactured after 1st July 2012. The label is accompanied on the actual tyre and gives consumers useful information to assist them when purchasing new tyres. On the right you can find an example of the new EU tyre label. These graphics on the label are similar as those already used for household appliances and more recently new cars. Rolling resistance is one of the main resistive forces on a vehicle, which acts as an opposite force to the direction in which the tyre is rolling. The rolling tyre deforms and dissipates energy. The tyre whose rolling resistance is greater, requires more fuel to move the vehicle forward. 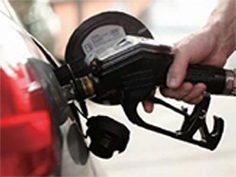 Therefore rolling resistance influences fuel consumption and the environment directly. 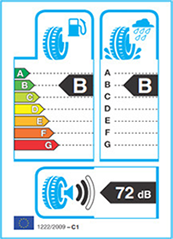 On the top left of the label, this shows 7 classes which range from A (most efficient)to G (least efficient), the grading indicates the tyre's contribution to fuel efficiency and CO emissions. Wet grip is one of the most important safety aspects of a tyre. 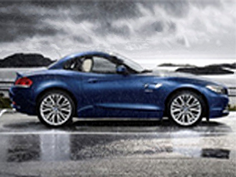 The tyres with excellent grip on wet surfaces have shorter braking distance when driving in rainy weather. 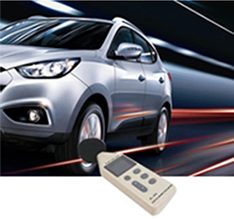 There are other important parameters which are also related to safety. However, consumers will be able to check and select for themselves their preferred performance. On the top right of the label, wet grip is also expressed in classes ranging from A (highest performance) to G (lowest performance).